Designers frequently reuse existing designs as a starting point for creating new garments. 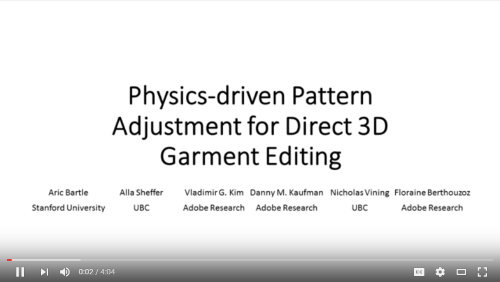 In order to apply garment modifications, which the designer envisions in 3D, existing tools require meticulous manual editing of 2D patterns. These 2D edits need to account both for the envisioned geometric changes in the 3D shape, as well as for various physical factors that affect the look of the draped garment. We propose a new framework that allows designers to directly apply the changes they envision in 3D space; and creates the 2D patterns that replicate this envisioned target geometry when lifted into 3D via a physical draping simulation. Our framework removes the need for laborious and knowledge-intensive manual 2D edits and allows users to effortlessly mix existing garment designs as well as adjust for garment length and fit. Following each user specified editing operation we first compute a target 3D garment shape, one that maximally preserves the input garment’s style–its proportions, fit and shape–subject to the modifications specified by the user. We then automatically compute 2D patterns that recreate the target garment shape when draped around the input mannequin within a user-selected simulation environment. 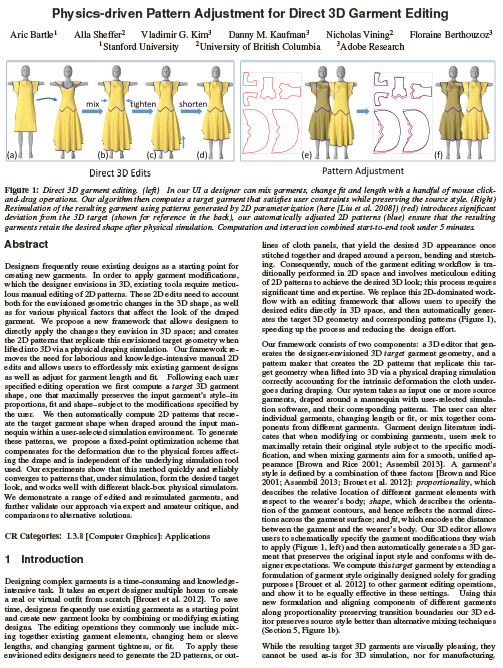 To generate these patterns, we propose a fixed-point optimization scheme that compensates for the deformation due to the physical forces affecting the drape and is independent of the underlying simulation tool used. Our experiments show that this method quickly and reliably converges to patterns that, under simulation, form the desired target look, and works well with different black-box physical simulators. We demonstrate a range of edited and resimulated garments, and further validate our approach via expert and amateur critique, and comparisons to alternative solutions. ACM, 2016. This is the author's version of the work. It is posted here by permission of ACM for your personal use. Not for redistribution.